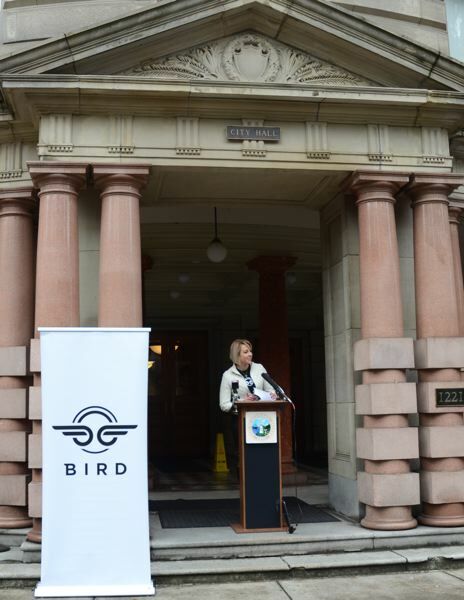 Bird reminds city that it would like to bring its electric scooters back to Portland, but few riders bother to show up. Electric scooter rideshare company Bird rallied outside City Hall at noon Wednesday, Dec. 12, to remind elected officials that it is still here. Scooters from Bird, Lime and Skip were removed by the companies on Nov. 21, at the end of the Portland Bureau of Transportation's four-month pilot period, in which Portlanders had unrestricted access to the electric-powered scooters throughout most of the city. Portland officials are studying data from the pilot project. They plan to issue a full report on the e-scooter experiment and decide whether the electric rides can return to city streets and sidewalks. Bird served branded water and cookies as well as vegetarian pizza to a crowd of a couple of dozen people gathered at the rally. 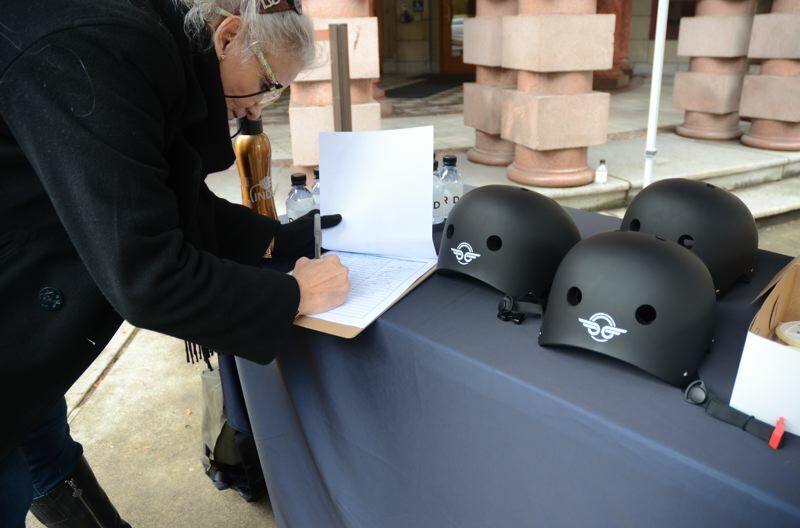 They also brought helmets, since riding without a helmet — which is illegal — is often cited in complaints about scofflaw riders. Local groups speaking in support of Bird and shared mobility in general were Forth Mobility and the Street Trust. Jillian Detweiler, executive director of nonprofit the Street Trust ("a movement for people who choose to travel and experience the Portland region by biking, walking, or riding transit") said that the city bureau of transportation expected its final report in mid-January. The bureau would then open the topic for public comment. Detweiler hoped the comment period would move quickly but be equitable. "I look forward to seeing e-scooters return to the streets of Portland as soon as possible," she said. Sergio Lopez of Forth, told the crowd that he hoped the city would continue the e-scooter project to provide "shared mobility option." 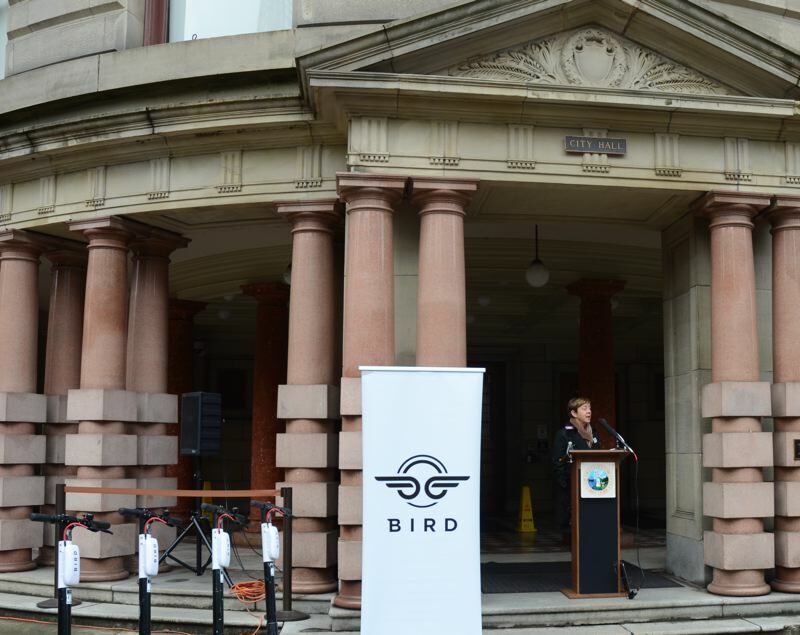 "We need to ensure companies such as Bird can continue to provide Portlanders with these shared mobility options," he said. "Forth advocates for affordable, equitable and accessible shared mobile transportation options, particularly those that reach disadvantaged areas. As the pilot data is assessed, e-scooter ridership should be continued as a mobility option." 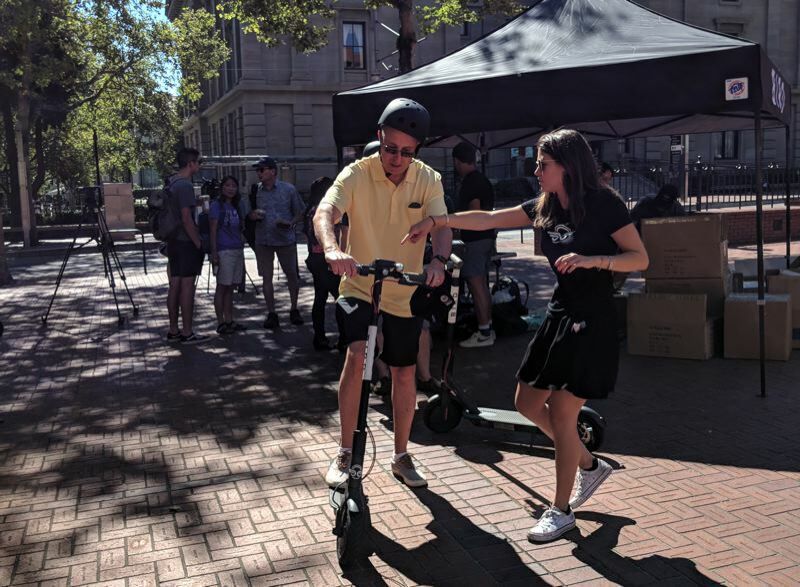 Olympia's senior manager of government partnerships at Bird, Joanie Deutsch, also called for the early return of the scooters — of all brands. Her speech was drowned out by chants of "No justice, no peace" from people nearby protesting something different. "Portland needs continued, uninterrupted access to low-cost transportation options that help the city remedy its addiction to cars," Deutsch said. "We urge city officials to immediately return e-scooters to the people of Portland, and once again make good on its promise of being a regional — if not national — leader in sustainable practices." Arriving later, Jeanette Shaw of Forth said e-mobility was good for the environment and people who can't afford a car. "We believe, while the city is analyzing the data, why not have that pilot continue?" Scooters are a small but visible part of the e-mobility ecosystem. Shaw lobbies for the electric vehicle industry in Salem and Olympia. She works on things like the electric vehicle rebate in Oregon and the Washington sales tax credit rebate that expired, and the electric vehicle tax credit at the federal level. What if the PBOT report said the scooters were a bad idea for Portland? "I'd be surprised if it did, because anecdotally, we know from our members that they were incredibly popular." She said riders should abide by the rules, "but with safety mechanism in place it's a terrific mobility option." The only option for stopping people from riding on the sidewalks would be ticketing. "But that will be for the e-bike community and the bike community to work with the city of Portland to come up with a solution that hopefully works for everybody," Shaw said. The city's e-scooter pilot project lasted from July 25 to Nov. 20. It was the first study of the scooters done in autumn. PBOT spokesperson Dylan Rivera told the Business Tribune the agency would share some of their findings in January. "We expect that will kick off a period of public involvement and help with a potential pilot in 2019." They are studying whether the scooters reduced the use of car and cut emissions and congestion, and how they were used in East Portland. PBOT insisted the companies drop several hundred scooters there every morning in the name of equity. The immediate decision is whether to not allow the scooters back, or to have another pilot. Only after that could a decision be made about having them here longer term. "At this point we're not considering permanent rules, but eventually the second pilot could become permanent." The companies would still have to reapply for their license to operate annually. 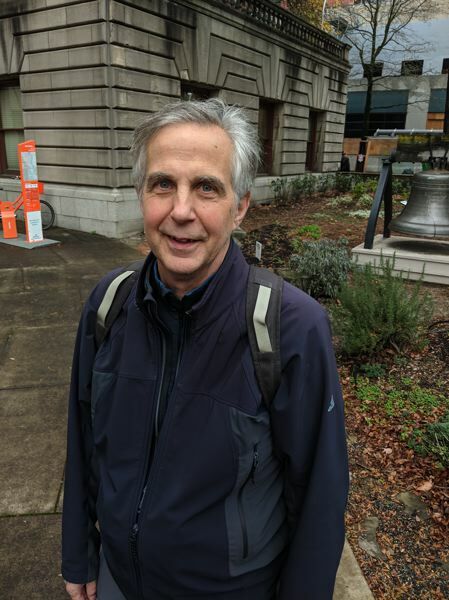 In the crowd, Glenn Traeger, a retiree who studied environmental engineering and lives in Northwest Portland, was there to tell a representative of Bird that riders should stay off the sidewalk. "I'm anti. I think it's been a failure," he said of the four-month test period. "A lot of trips are taken on the sidewalk, jeopardizing the safety of pedestrians. That's just not right." He said Bird and the city of Portland should develop some kind of self-policing. He suggests that unless there is a program directed to assuring pedestrians that they can walk the sidewalks safe from being hit by e-scooter riders, Bird should not get a license to operate here. What would that program look like? "Education would work for new riders," he said. He thought the splash screen on the scooters should tell riders to wear a helmet and stick to the bike lanes, but a Bird employee informed him it already does. "The other issue is that when riders are downtown they won't follow the one-way streets, they use the sidewalks for the shortest distance." Traeger suggested that the public should be able to take photos of law breakers and send them in to Bird for reprimand and maybe a short ban. He suggested they add a license plate or number to the scooters for quick identification. He also found it hard to walk his dog with scooters passing them on the sidewalk. "All I want them to do is follow the rules. Based on the survey, I'm in the zip code that has the most traffic. It got to the point that on nice days, when I left my apartment, I had to look both ways before I could enter the sidewalk, not knowing if someone was going to be scootering on the sidewalk." He said he had moved about 20 scooters blocking sidewalks, but it was no big deal, since he already picks up trash. "There's this conflict between pedestrians and scooters, and you have to make a choice and go with pedestrians." He also thinks using the Internet of Things and GPS, keeping them out of the parks would be easy. "Take their license away for a month — just for a month — to reinforce it." Mobility companies are fighting over the last mile market and e-scooters have shown great promise for their ease of use. In July, 2018, rideshare company Uber invested in Bay Area-based electric scooter rental company Lime as part of a $335 million round, including promoting Lime in its mobile app. Uber also bought the electric bike company JUMP for $200 million to acquire the company in the spring. Lyft has its own branded scooters in Arlington, Austin, Denver, Los Angeles, Santa Monica and Washington, D.C.